PURPOSE OF POSITION: This position will be open until filled with a first review of applications May 3, 2019. Support the community and economic development efforts of Todd County Development Corporation (TCDC) and their mission to promote and sustain diverse economic development through education, training and technical assistance that improves the quality of life in Todd County. This position has an emphasis on advertising and is clerical and customer service in nature. It requires good writing skills, familiarity with social media and web-site editing. Training is available from our website gatekeeper. Todd County Development Corporation (TCDC) is a 501c3 non-profit organization and the internship is funded through Sourcewell for up to 640 hours during the duration of the internship. This position allows for flexible scheduling. TCDC mileage reimbursement for travel related to TCDC projects (.58/mile). This position is based at the TCDC office located at 347 Central Ave, Long Prairie MN but some work may be done from home. Basic Performance Expectations of all Todd County Staff • Serves as a positive example to other County personnel with regard to workplace actions, decisions, work skills, attitude and adherence to workplace policy and procedures. • Has strong communication and interpersonal skills, is honest, fair and dependable. • Embodies teamwork and cooperation within and across County departments and with the public. • Communicates effectively with the Department Head and keeps supervisor apprised of important matters ongoing in the department. • Respect all colleagues, co-workers, board members and the public and lead those around you to do the same. • This position requires regular and timely attendance in accordance with the department schedule. • Performs other duties as assigned or apparent. PURPOSE OF POSITION: Under general direction of Health & Human Services Unit Manager and/or Supervisor, performs work of considerable difficulty in providing intensive social work for the protection, rehabilitation and care of adults and children in voluntary and involuntary services. Provides case management, evaluating and assessing the success of services being provided, recommending other services that may be useful and related work as apparent or assigned. May provide work direction to paraprofessional staff. Work is performed in accordance with Federal, State and Agency guidelines. Basic Performance Expectations of all Todd County Staff • Serves as a positive example to other County personnel with regard to workplace actions, decisions, work skills, attitude and adherence to workplace policy and procedures. • Has strong communication and interpersonal skills, is honest, fair and dependable. • Embodies teamwork and cooperation within and across County departments and with the public. • Communicates effectively with the Department/Division leader and keeps management apprised of important matters ongoing in the department. • Respect all colleagues, co-workers, board members and the public and lead those around you to do the same. • This position requires regular and timely attendance in accordance with the department schedule. • Performs other duties as assigned or apparent. This position will be open until filled with first review of applications 03/26/2019. met. Provides controlled movement of inmates between the courts and detention center. • Has strong communication and interpersonal skills, is honest, fair and dependable. of important matters ongoing in the department. engineering plans, and permit standards. • Embodies teamwork and cooperation within and across County departments and with the public. • Communicates effectively with the Department/Division leader and keeps management apprised of important matters ongoing in the department. • Respect all colleagues, co-workers, board members and the public and lead those around you to do the same. • This position requires regular and timely attendance in accordance with the department schedule. • Performs other duties as assigned or apparent. Job DescriptionThis position acts as an assistant supervisor to the 3rd shift Sanitation Supervisor at the Long Prairie plant. This person will help lead and train employees in a variety of areas. The areas of responsibility include: learning night cooking, night tumbling, various responsibilities in the sanitation department, including pre-op. Additionally, several daily, weekly, and monthly tasks will be assigned. This person may be required to perform various duties on second shift as needed/scheduled. Ability to follow verbal and written requirements. Ability to be flexible regarding start times and job responsibilities performed. Good attendance and performance history. Ability to use and learn how to operate various computer programs. Ability to use industrial cleaning chemicals. 10. Ability to drive a forklift and power work saver. Candidates with previous industrial sanitation experience and leadership roles are preferred. Dan's Prize Inc., is an equal opportunity employer. All qualified applicants will receive consideration for employment without regard to race, color, age, religion, gender, gender orientation, gender identity, national origin, disability, or veteran status. Dan's Prize Inc., processes and packages meat product at two production facilities located in Browerville and Long Prairie MN. We have over 600 different meat products; we work with beef, pork, chicken, and turkey. Dan's Prize was started in 1986 with 12 employees, and our continued growth has brought us to where we are today with over 530 people.Our facility is 40 degrees, so be prepared to work in a cold factory/warehouse environment. Our work is repetitive and could involve lifting up to 40 pounds. The purpose of this position is to create and update safety training, policies and procedures. This job will be open until filled with the first review of applications March 15, 2019. Rose City Sign Company is a family owned company that has been in business for over 35 years. We are looking for new employees to join our team. Class A CDL preferred but may train the right people. The position involves travel with being home on most weekends. 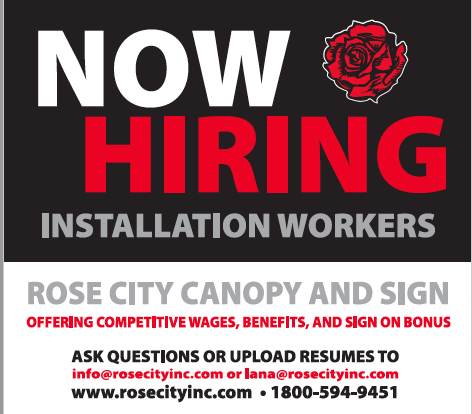 Rose City Sign is a drug free company that offers competitive pay, vacation, holiday pay, IRA and health insurance. We also pay for all hotels, per diem and travel time. site. Please stop in to fill out an application or visit our website at www.rosecityinc.com. PURPOSE OF POSITION: The purpose of this position is to assist the public with disposal of garbage, demolition, household hazardous waste and recycling products. To operate facility equipment within safety guidelines for appropriate distribution and disposal. Basic Performance Expectations of all Todd County Staff • Serves as a positive example to other County personnel with regard to workplace actions, decisions, work skills, attitude and adherence to workplace policy and procedures. • Has strong communication and interpersonal skills, is honest, fair and dependable. • Embodies teamwork and cooperation within and across County departments and with the public. • Communicates effectively with the Department/Division leader and keeps management apprised of important matters ongoing in the department. • Respect all colleagues, co-workers, board members and the public and lead those around you to do the same. • This position requires regular and timely attendance in accordance with the department schedule. • Performs other duties as assigned or apparent. This position will be open until filled with first review of applications 04/17/19. The objective of the Clerical / Records Intern is to support the Sheriff's Office, assist the records department with maintaining files, and follow the mission of the Todd County Sheriff's Office by performing various required clerical functions. • Serves as a positive example to other County personnel with regard to workplace actions, decisions, work skills, attitude and adherence to workplace policy and procedures. Plant Operators, Long Prairie, Central Bi Products MN Farmers Union Industries, LLC, also known as FUI-, is a leading agricultural based manufacturing company based in Redwood Falls, MN. FUI is a premier provider of specialized products, providing superior value and services to our members and customers. Our current operations include Central Bi-Products, Northland Choice, Midwest Grease, Artex Manufacturing, Pet Care Systems, Redwood Farms Meat Processors, and Performance Pet Products. FUI currently manufactures in 6 facilities in a three-state area, including: Redwood Falls, Long Prairie, Waite Park and Detroit Lakes, Minnesota; Mitchell, South Dakota and Estherville, Iowa. Reports toPlant SupervisorJob PurposePlant Operators are responsible for operating processes and equipment in a safe, clean, effective manner to ensure the production of high-quality products while meeting all regulatory compliance requirements. Class A CDL Truck Driver, Long Prairie, Central Bi Products MNFarmers Union Industries, LLC, also known as FUI, is a leading agricultural based manufacturing company based in Redwood Falls, MN. FUI is a premier provider of specialized products, providing superior value and services to our members and customers. Our current operations include Central Bi-Products, Northland Choice, Midwest Grease, Artex Manufacturing, Pet Care Systems, Redwood Farms Meat Processors, and Performance Pet Products. FUI currently manufactures in 6 facilities in a three-state area, including: Redwood Falls, Long Prairie, Waite Park and Detroit Lakes, Minnesota; Mitchell, South Dakota and Estherville, Iowa. Areas of AccountabilityAll areas of accountability to be delivered in a manner that aligns with the values and business strategy of Farmers Union Industries, LLC. This would include every other weekend and every other Holiday. No experience necessary and we will train the right person.